Going to see a Creation Theatre production is something that I have been meaning to do since hearing about the mirror tent productions several years ago, but have never actually gotten around to it until last night when I went to see their production of Doctor Faustus performed in the depths of the Norrington Room basement of Blackwell’s bookshop. I didn’t know much about Kit Marlowe’s story of a scholar who sells his soul to the devil in exchange for twenty-four years of knowledge and power before attending the play, but was gripped by the fabulous performance of Creation’s players as they brought to life this chilling, yet also humorous tale. The whole cast of five was wonderful, but the performances of Gus Gallagher as Faustus and Gwynfor Jones as Mephistopheles really stood out. Poor Faustus, with his greed for knowledge and power, yet his turmoil and despair at the prospect of eternal damnation, and wicked Mephistopheles with his dark humour; both were excellently portrayed in a way that both sucked me into the story and kept me entertained. 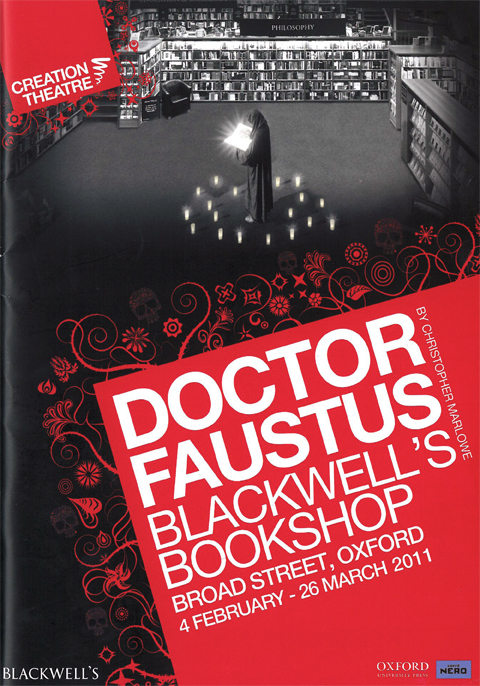 The setting of Blackwell’s was perfect for Doctor Faustus, and whilst the audience watched from seats set amongst the bookshelves, the production made good use of books as one of the few props included. Books were even used to great effect in the opening minutes which were almost a sensory experience combining books, stage and sound to produce something quite opposite to the silence that is usually to be found accompanying books. The whole combination of setting and production was thoroughly enjoyable, and it certainly won’t take me as long again to go and see Creation Theatre.